Jaw-dropping camera specs coming to smartphones. 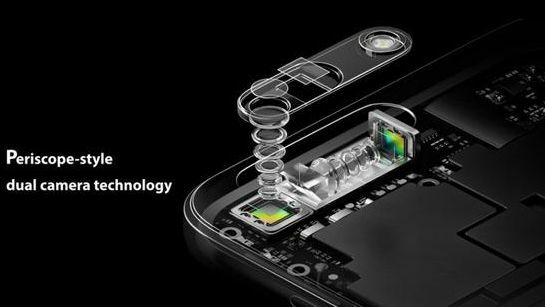 It’s official: Oppo has revealed what it is claiming the world’s-first 10x ‘optical’ zoom on a phone, at an event in Beijing. This confirms rumors earlier this week that it was prepping to showcase its innovative technology, which means that, if used on a camera phone, it will offer a zoom ranging from 15.9mm to 159mm (the equivalent of). So, how does this zoom work – given there’s such a small area on a phone to cram the necessary lenses in? Oppo is using technology that it had revealed before as the base of its zoom. This is a 5x optical zoom sensor that was announced back in 2017. Added to this is a wide-angle zoom lens and there is also another lens in the middle that will allow for regular shooting and doesn’t actually do anything to the zoom. On top of this is Oppo’s periscope technology that allows for optical zooming. This is all complimented by Dual OIS image stabilization. Now, this technology – as amazing as it is – means that the zoom is a hybrid of optical and digital, and not pure optical that was teased. This is something that we saw in great effect recently with the Huawei Mate 20 Pro. Huawei managed a similar feat with its 3x optical zoom which was hiked to 5x using its hybrid capabilities. As for a release date. We will know more at MWC 2019, when this technology will be properly shown off and we can see if it veers into best camera phoneterritory. Don’t hold your breath to see this on a phone anytime soon, however. Oppo’s 5x optical zoom tech never actually made it to market so there’s no guarantee that this will, either.